Walking can be incredibly pleasurable and at the same time energy-sapping. On any Life’s An Adventure pack free guided walk you could be dealing with steep hills, rock-hopping, long unbroken trails, endless steps and sand walking – all of these things require effort and energy. So what do you do when you begin to tire? And the best way is with a healthy, nutritious, energy-loaded snack, so check out these eight excellent options. 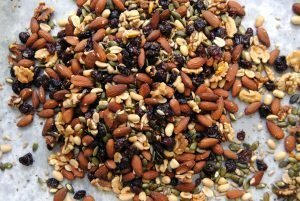 Scroggin’ scoffin’ – also known as a trail mix, this is a perfectly lightweight snack that can be easily stored in your pocket. It’s a bag full of healthy fun with a combination of dried fruit, nuts and chocolate. They can be bought pre-mixed or personalised to suit. Add some yoghurt-covered raisins, dried bananas, soy crisps and salt-covered nuts to add punch to the bunch. Scroggin is the choice of snack for all Life’s An Adventure guides and you’ll get the chance to make up your own mix prior to your day’s walking. Promise! Choco loco – packed with high energy due to the amount of sugar, you can beat fatigue with a Cadbury Twix stick. Cacao contains caffeine and the fat in cocoa butter becomes burnable fuel when active. In summer, opt for chocolate sultanas as they are less likely to melt, and melt a bar of chocolate for a cup of hot coco in winter to keep you feeling fuzzy inside. Tutti fruity – Strawberries, pineapple and papaya pack a punch, but apples provide energy that will stick around longer than most other fruits. Oranges provide a lot of energy and vitamin C, and are refreshing on summer hikes. Bananas are full of magnesium and potassium that serve as a muscle and nerve relaxant so maybe they’re better at the end of the day. Try dried – dried fruit is an excellent energy space saver. Spoil and spill proof, it also contains good vitamins and calories to keep you moving. Dry your own fruit to save yourself from chemicals and sugars added to packet bought fruit, and try mixing your favourite dried fruits to spice things up. Just remember to drink plenty of water to avoid dehydration. Raise the bar – mixed with cereal, energy bars are a source of carbohydrates for energy and protein for muscle repair that you can store in your pocket. This pocket rocket regulates blood sugar, refuels glycogen and fights fatigue. 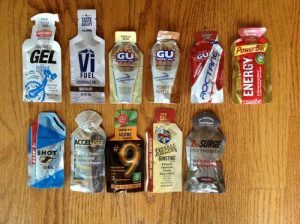 Different brands of energy gels. Go-go gel – energy drunk from a squeezable container is as quick as it gets. Energy gels are packed with a high concentration of carbohydrates in a semi-liquid form and boost energy faster than energy bars. Jerky jumping – trimmed of fat, cut and dried, it’s easy to store and perfect to take camping or hiking. It’s full of energy, with nine grams of protein per ounce of jerky. It also contains iron, vitamin B12 for healthy red blood cells, and comes in a variety of meat, such as beef, lamb and pork. Dates are packed with goodness. 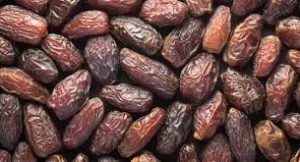 Looking for a date – dates have a large percentage of glucose, which the body can quickly transform into energy. This pint-sized treat is super easy to pack in your bag or pocket, and delicious to enjoy on your hike. It also contains fibre, potassium and copper minerals for the body.